Go One Month Without French Fries. DONE. Here I am to report back good news on the goal front! Since July 1st I have been working slowly but surely on two simultaneous goals on my 40 by 20 list, one to lose twenty pounds (#11) and one to go one month without consuming a delicious carb laden fry (#8). 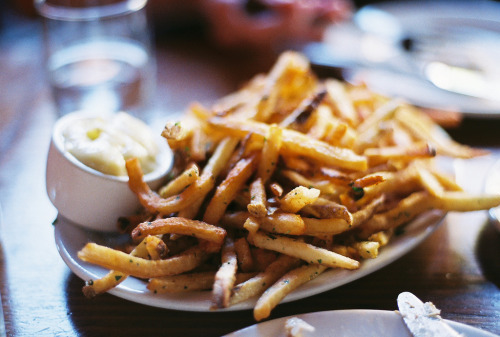 Fries were one of the hardest things to give up for me. They could easily be considered one of my favorite foods of all time. That's why I knew eliminating them would be a challenge, but a good/healthy challenge to take on. I am proud to say that it's been one month and I have been totally fry free. I may have smelled the fries and yes, there was that one time I licked one and then threw it away, but overall I feel pretty accomplished. Cutting out fries has greatly aided the healthier eating habits I've been attempting to incorporate in to my diet over this past month as well. For now, I'm going to for-go fries until I reach my goal weight or lower (which could be months or maybe even a year) and then slowly incorporate small/manageable portions in every once and awhile as I attempt to maintain. I'm very dedicated so far. Somehow without fries I feel a little freer, but I will never say that it isn't a challenge to cut-out your favorite food item. Check out my 40 by 20 list here! Have you ever attempted to cut back on a certain food item or drink? One month without french fries?! Ah, I don't think I'd be able to do it. Congratulations on reaching your goal! It feels good doesn't it? How?! They are so delicious!